I have still been working away at 1 of the 3 blankets this week, but this afternoon I decided I need a little break and thought I would try a crocheted shrug for my little miss. We went to a birthday party last Saturday night and it was quite cold after the sun went down so I thought a little shrug would have been good over her sundress to keep her shoulders warmer. 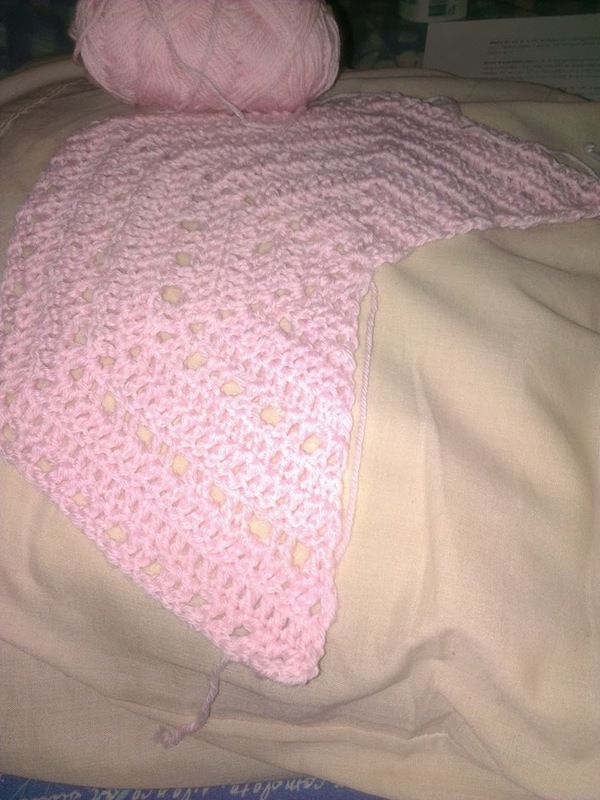 To find a pattern/idea I googled and checked out pinterest (of course) and I came across a lovely idea using a shawl pattern but shorter and adding a little stitching to make 'sleeves'. The actual shawl pattern is here and I am tempted to make one for myself later on. I am using 4 ply merino wool and a 4.5mm hook. I decided I didn't want it to be too 'lacy' as I wanted it to give her some warmth, hence I chose a slightly smaller hook. So far I have done 18 rows and I will check out the size on her tomorrow morning (half tempted to wake her now to check, but I know that would be silly!). If it's okay then it will just need some finishing off with stitching and single chains around the neck .... and maybe a shell edge to make it a little frilly! I have another ball of the same yarn and am contemplating making another for a friends daughter. Her birthday is coming up so it would make a nice gift and we are seeing them this week so I can have a little look to check if sizing will need to be similar or bigger/smaller than this one. Hope to share some better pictures of my blankets soon!